Pigs are nature’s atomic weapons. They eat everything in sight, and can turn a lush green lawn into a post-apocalyptic wasteland in a matter of hours. You will never hear the call for “free-range” pigs. Pigs need to be penned. They go in when they’re cute little piglets, and the leave in a big truck on the way to the slaughterhouse. In between, they’re guarded like Ted Bundy on death row. I knew this. I built my pigpen strong and sunk the fence about 12 inches below ground level. Still it was impressive to see what little piglets could do. The interior of the pen was green grass. Inside of 20 minutes, it was all munched down to ground level. 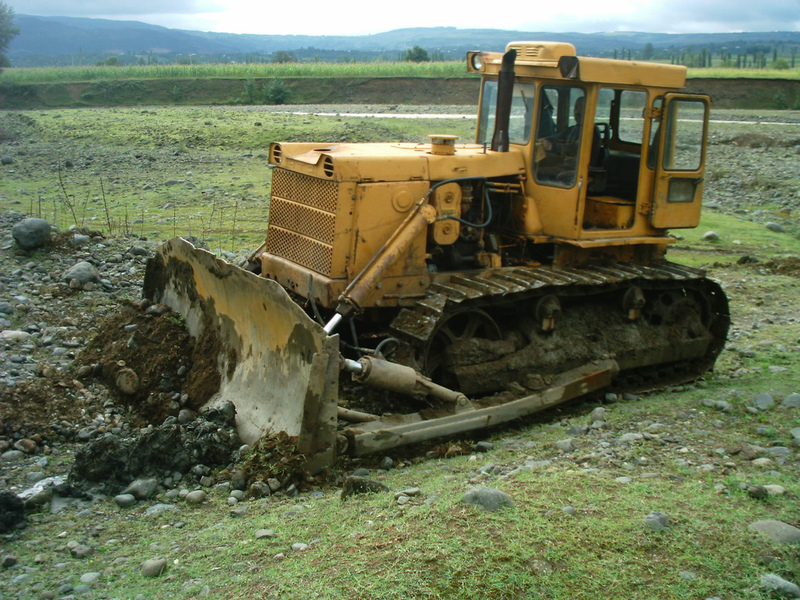 Then they started to root up the ground like little bulldozers. 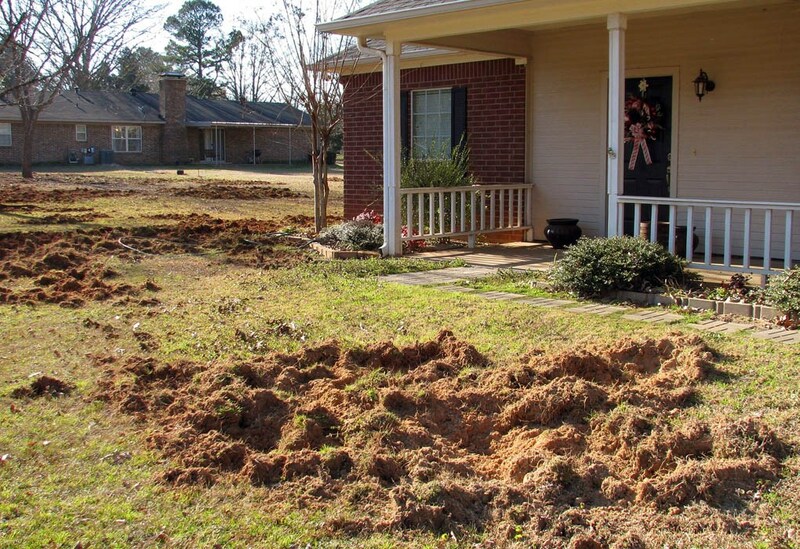 With all the grass roots gone, they dug for grubs. With the grubs gone, they sat back and admired their work. They were always kept well-fed, or else I’m sure they’d have started on the steel fencing. They quickly grew from 25-lb cute little piggies, 300-lb smelly fat hogs. I built the pigpen out of materials scavenged from a lumber yard that was closing down. It mainly consisted of of galvanized steel fencing in sections that were about 8 ft high and 20 ft long, with 2-inch galvanized pipe which I sledgehammered into the ground at the corners and along the sides. I painstakingly dug a ditch about 12 inches deep to bury the fence and prevent the pigs from tunneling out. Every structure has a weak spot. In the case of the pigpen, it was a big steel gate covered by chain link in one end to get in and out. The gate was flush with the ground without the buried 12-inch buffer. I built a tar-papered lean-to in one corner to keep them out of the weather, and I found an old aluminum trough that I used to hold the feed and various pig goodies. 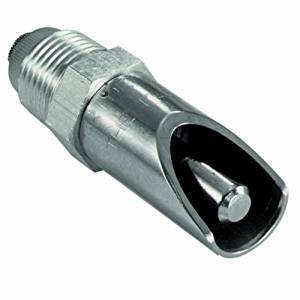 Growing pigs need a lot of water, so I found this really cool drinking nozzle at my local feed store that I hooked up to a garden hose. It took the pigs about 10 seconds to figure this out. They came up to it and tried to bite it. instead, they got a mouthful of water. Worked like a Swiss watch. The first year, we had only one pig. And he was not so ambitious. 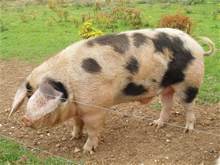 It led to a false sense of security during the second year when we had two pigs. 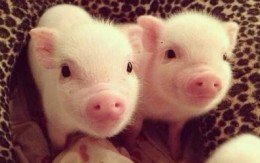 Two pigs are twice as devious. So the pigs bided their time. One hot summer day, they decided it was time to test the defenses, and dug under the gate. I got the dreaded call at work, “The pigs are out!” I knew better than to say, “Well get them back in.” Instead, I told my boss I had an emergency at home, packed up for the day and headed out. On the way, I tried to figure out just how I was going to chase, catch and move these behemoths back to the pen, and how I was going to reseed the lawn. You see, pigs are fast. Real fast. 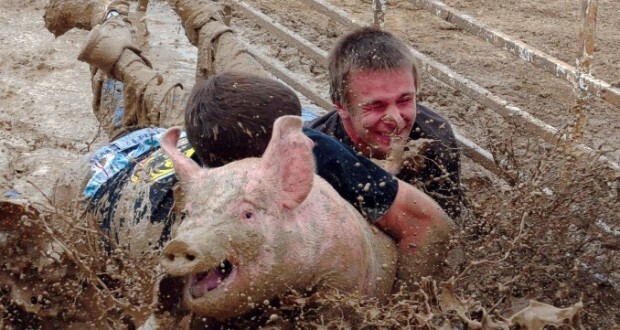 You don’t see them holding greased sheep or greased turkey contests at county fairs. And those fair pigs are tiny, not humongous beasts that weigh more than you do. The more I thought of what I’d do, the more I despaired. The yard would be toast. The pigs would assault neighboring fields. Mayhem would ensue. It would be the rogue cows all over again. So what did I see when I got home? Two pigs happily in their pen chowing down on what I thought was a rather large portion of Purina pig chow. 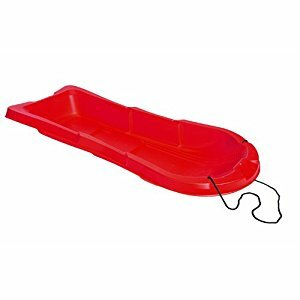 Oh, and they had a bright red plastic sled in the pen with them. A bit of the ground around the pen was neatly bulldozed and part of my garden was in ruins, but the wholesale destruction I feared did not take place. Exactly how did this happen? It was easy to see where the pigs had tunneled out under the gate. There was now a tractor tire perched over the hole. I’m sure the pigs would’ve made short work of this had they not had the pig chow. What follows is the brilliant moves that the ex used to re-acquire the pigs. She did not panic. First she opened the gate to the pen as wide as she could. The pigs stopped for a moment while destroying my zucchini plants to laugh at this in pig fashion. Second, she got the big bag of pig chow out of the barn. This got the pigs’ attention. Then in a stroke of Einstein-like brilliance, she got the kids sled out of the shed. She hooked on a 50 foot length of nylon rope to the sled’s shorter haul rope. She parked the sled sufficiently far away from the open gate, then ran the rope through the pen and through the fence on the far side away from the gate. She then took the pig chow. By now, the pigs had stopped ravaging and were watching in fascination. She poured the feed onto the sled, then ran around the far side of the pen and took up the rope. Cautiously, the pigs made they way over to the sled and started to eat greedily. She then pulled the rope so that the sled would slide toward the open gate of the pen. Now she had to do this several times. If she pulled too slowly, the pigs would eat all the feed before the sled got into the pen. If she pulled too quickly, it spooked the pigs and they would back away. Eventually, like Goldilocks, she got it “just right”, and the pigs entered the pen giving her time to run around, shut the gate, and roll the tire across the hole. When I got home, I highly praised her ingenuity. I believe in giving credit where credit is due, and I had come up with absolutely nothing that would get them back in there. I did fix the problem with the gate by taking cut pieces of two-by-fours that I had sharpened with my miter saw, and hammered them about 12 inches into the ground just outside the gate making a wall. This way, the gate could still open inward, but the pigs would have to dig to China to get out that way. The plan worked, and the pigs stayed put until the big truck came in the fall, the freezer was filled and the rest is delicious history. The moral to this story is to never underestimate pigs. Pigs have nothing to do all day but eat, sleep, get fat and plot the downfall of mankind.